WTH?! (What the Heck?) moments are attempts to find the memorable and the off-beat perspective on Longhorns sports. Here are some interesting moments from the Texas game against Iowa State. 1st Quarter (15:00) WTH Fans?! It was a very special day where the Longhorns honored our armed forces and remembered Darrell Royal. Just wish the 100,018 fans came early to be a part of the festivities. 1st Quarter (10:51) WTH Wishbone?! 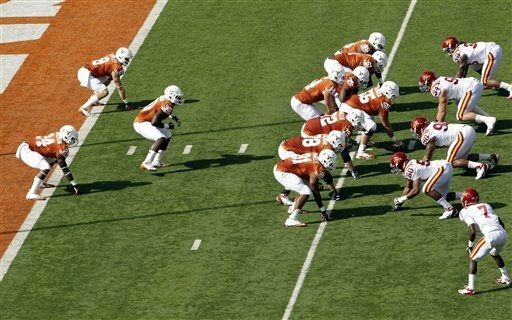 Don’t think one fan in the stands thought the tribute formation for DKR would result in this type of trickery. But we should expect the unexpected when it comes to OC Bryan Harsin and this team. 1st Quarter (3:32) WTH Bomb?! This is starting to be a trend with David Ash hooking up with Mike Davis for a long touchdown. A 61 yard pitch and catch by this tandem is starting to be a work of art. 2nd Quarter (2:53) WTH Tony?! Anthony Fera may need to find out who stole his mojo. A 32 yard blocked field goal and a missed extra point will get you pulled from the game. Oh wait, it did since Nick “Error” Jordan took over and made everything he hit. Am I little too hard on kickers? Halftime WTH Band?! What a great tribute to DKR with the band spelling out Royal on the field. Nice touch with the band forming a war ship, submarine and a plane to honor our military. 4th Quarter (7:46) WTH Brown?! We have a sighting confirmed that Malcolm Brown is on the field at running back. Malcolm was given a heavy dose of the rock to close out the game. The combination of all of the running backs netted the Longhorns over 222 yards for the game. 4th Quarter (5:14) WTH Turner?! Who is Josh Turner? The sophomore is the newest crop of defensive players that are stepping up like LB Steve Edmond. Josh’s interception late in the game put a capper to an excellent defensive performance. Next up for the Longhorns is a Thanksgiving Day date with the TCU in Austin on November 22nd.